I had the pleasure of working with Vinh from the diamond selection and custom design process, through the build and completion of an engagement ring…. I highly, highly, highly recommend working with Vinh, and have already recommended him to one very close friend (others to come)! If you get the chance to work with Krista, do it! She did an absolutely wonderful job on this project. She took everything I said (which was quite a bit!) 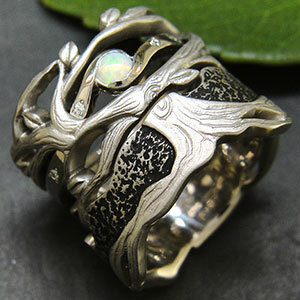 and incorporated all of it into this beautiful ring. Just about everything on the ring has some kind of significance. 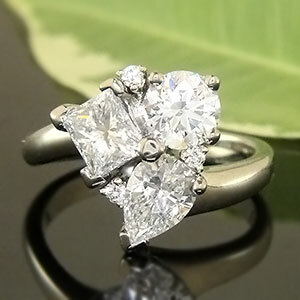 Probably the aspect that is most special to me is the diamond, which originally belonged to my grandmother. My mother very graciously allowed me to use the diamond for this ring, and I think brings a great deal of meaning and significance with it. The Hebrew saying is from Genesis two, and it says, essentially, 'they became one flesh'. The rubies are in reference to Proverbs 31, which my mother asked me to memorize when I was a young teenager to aide me in my discernment of what kind of woman I should be looking for to marry, and I certainly believe my soon-to-be fiance meets the Proverbs 31 standard. The vine that is engraved behind the Hebrew words is in reference to John 15, and the two rubies in the top face are intended to be fruit on the vine. Also, there are three vines, three stones visible from the top face, and three stones visible from each side face, and there are a total of seven stones. I think that covers everything; if I remember something else I will report it here! Ellie, did a fantastic job! 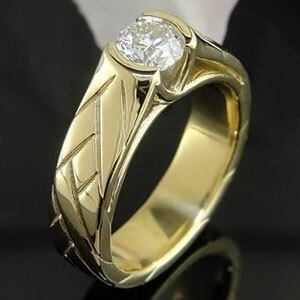 Anna's ring is made of 18K yellow gold; and has a round/split shank with pierced detail. It has a 4-prong trellis setting, with floral accents on either side. 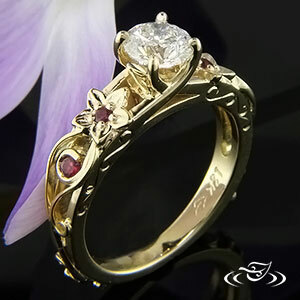 Other design elements include red sapphire accent stones, hand-crafted filigree, and custom engraved scrollwork on the faces. 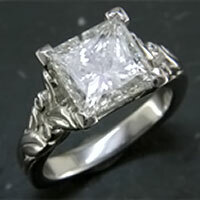 The center stone is a round brilliant, ideal cut diamond (0.75 carats, near-colorless, & internally flawless). Ellie and GLJW were fantastic, and created a beautiful, custom engagement ring for about the same cost as that of a mass produced ring sold by chain jewelers. I highly recommend them if you know anybody who is jewelry shopping! My dragon is in hand and I don't even know what to say. No matter how many pictures you sent, I wasn't ready. It's incredible. There are no words to say thank you enough. You made him EXACTLY what I wanted him to be - when I didn't even know for sure myself. He is artistically amazing, and technically perfect. Please relay my gratitude and my awe to everyone who had anything to do with him. So just a few more comments on things I wasn't expecting (all good). The stone is amazing !! Thank you for being my eyes on that. I've never seen anything like it. It has amazing fire. I took it into the sun and actually ended up making a video of it because of the sparkle. Unreal. Also - dude - it's HEAVY !! I like that but wow - that's a lot of platinum! After shopping around at other jewelers, we were so happy to find Green Lake Jewely Works. 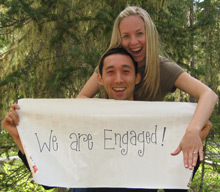 The staff was friendly, warm, and gave us lots of great ideas for choosing our ring. 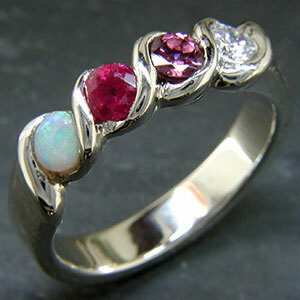 At first we were a bit overwhelmed with the idea of creating our own ring; we didn't know how it would turn out. But we knew that the other jewelry stores didn't have exactly what we wanted. After just a short time with Melissa, we knew that we were in good hands, and every step of the process was more and more exciting. The whole experience of designing our ring was wonderful. Having a one-of-a-kind ring means a lot to us. We feel that our love is very special and unique, as I'm sure a lot of couples do, and only a very unique ring would feel right. We love looking at our ring together. It's perfect!" It's the first time Whitney had seen the rings since they had been finished (even the final pictures were kept a secret!) and it is absolutely perfect. We are especially thrilled with how much color and life the opal has for its size, and the intricacy and perfect fit of the engagement ring and wedding ring, and Jason is disappointed he doesn't get to wear his ring yet because he likes it so much!!!! Thank you so much for all your hard work and effort. We have been recommending Green Lake Jewelry to everyone who is considering customized jewelry - and we will definitely be back for any future plans!! Thank you again -- please feel free to use this message to share "Why Green Lake was for us"! I never would have thought that I would design a new wedding band and never meet my designer, see the diamond I selected, or held the wax impression. Last week I received this ring and it was perfect--everything from the design, the beautiful diamond, and the fit. 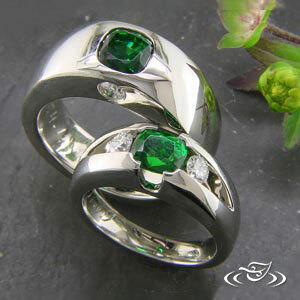 After I lost the diamond from my well worn wedding band, I started searching the internet for a jewelry designer who creates wedding bands that are different from the usual jewelry store variety. 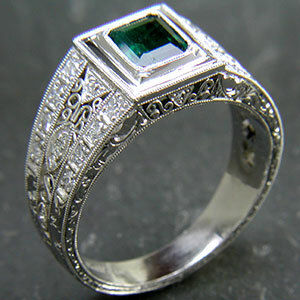 I finally found the Green Lake Jewelry Works site and spent hours looking at bands. I finally asked about cost and designs, and Elise became my designer. She was very patient and helped me get the look I wanted with helpful suggestions. She also help me pick the best diamond for my budget and ring design. This process took several months but I wasn't in a hurry and wasn't sure what I wanted. 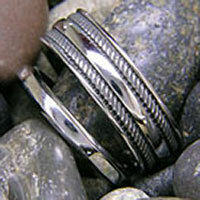 All in all, working with Elise and Green Lake Jewelry Works was a very positive experience. If anyone has doubts about dealing by internet, please know that it worked for me! I love it... WE love it! And love isn't even enough of a descriptive. I am so thrilled with it I can't stop looking at my hand, and Tony keeps "holding" my hand so he can admire it too. Yay! 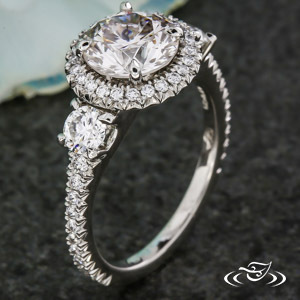 You and Kelsey and your team did such a great job, I can't imagine it being any better (design, quality -- WOW, service, everything)... You have absolutely dispelled my skepticism about creating a custom designed ring over the internet, sight unseen. I'll continue to tell people who ask, who made my FAH-bulbous ring. And, we inherited a couple small pieces of jewelry and will likely have them re-set, which naturally would mean that we would need a MAH-velous design. So, we'll be in touch when we embark on that creative adventure. I could keep gushing but I don't want to nauseate you. Adrienne, this is from a note I sent to my family. I was asked how wise it was for me to send my diamonds off to a company I found on the web, so I thought I’d share the finished rings, which are now in our hands. They are more beautiful than their photos expressed. We'll be sure and recommend you to others! As you know by now, Jason and I couldn't wait to get the rings so we came in on Sunday and picked them up. They look terrific! I can't thank you enough for everything you did to make us happy with our end product as well as the process. We know you have clients who spend significantly more money than we had to spend and we both felt like we were treated just as well, regardless. You totally understood our priorities and didn't ever pressure us to do more than we felt comfortable doing. I also love that you were able to help Jason with my birthday earrings- I think that was the first time he's been able to keep a secret from me for a surprise (he has a problem with that) and he definitely benefitted from your assistence. Please do share what we've said- I know how important it is to get the word out to customers. We were apprehensive at first thinking that a custom jewelry store would be more expensive than your traditional jewelry store and were delighted to find it is actually the opposite. And I love my earrings. Jason botched the proposal (even though I knew it was coming) because he was SO excited he was practically bouncing so I was shocked he held it together for my birthday. He even had a decoy gift for the actual day so I thought that was it. Thanks again for a great experience! We truly enjoyed working with you. I'm writing to inform you of the incredible experience both my wife and I had in dealing with your employee Amber. With us living in Park City, UT my wife had made prior arrangements to meet with a designer while we were in Seattle, as it turns out this was to be Amber . 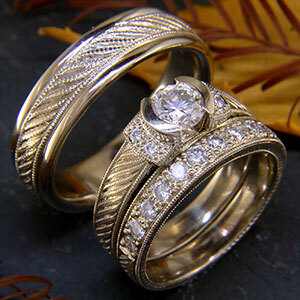 If I can back track a little, we had originally been in your old location looking at rings approximately 3-years ago. At that time my wife had picked a design that she thought was the ring she wanted. During our visit with Amber, she showed the intuition that you don't see in many people. 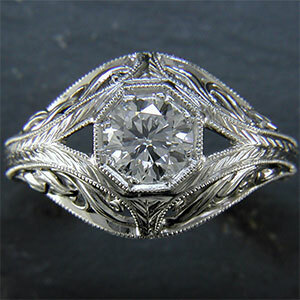 This eventually led to design of my wife's ring that we could have only dreamed of. Amber took the time to talk with us and ask questions that gave her a better understanding of our life style. 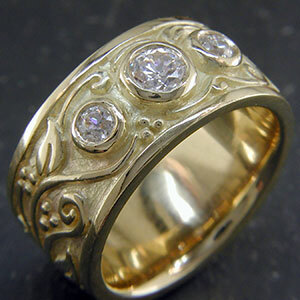 Amber then came up with a design of Hibiscus leaves in a continuous pattern around the ring. Without taking the time ,Amber would've never understood how special of a place that Hawaii is to both my wife and I. Not only is this where we were married & have lived, but we both have very special ties to Hawaii. 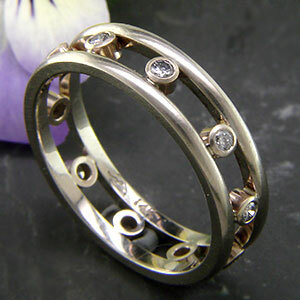 My wife is also trying to get involved in designing and making jewelry & at some point working in the jewelry industry. Amber was kind enough to take some time and talk with my wife & gave her some information on how to get involved with the apprenticing process. In today's hurry hurry everyday lifestyle it's very rare that you get the opportunity to be treated in such a way as I described above. With our many visits to the Green Lake Jewelers, I can tell that this type of customer service is what is expected of your employees. However, it's also my experience that there's one thing you can't teach and or train people in & that's in the personal touch that Amber shared with us. I have been wearing my rings now for over four months and each time I look down, I smile on how happy the design and workmanship makes me feel. Your company definitely has the gift of creativity and patience. I truly appreciated the non-pushy environment and non-opinionated suggestions. You truly allowed “me” to be the person to make the choices and didn't make me feel obligated if it turned out – I didn't like my first wax. 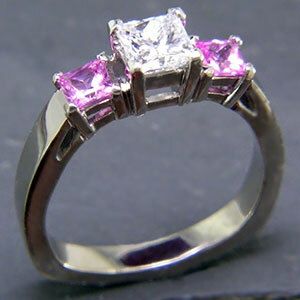 Thank you again for such a beautiful ring design and your patient attitude. It was worth it! Thank you, thank you, thank you! I would like to sing the praises of Greenlake Jewelry Works. You guys are amazing!! My Fiancée and I came into your studio with a picture of what we wanted for my engagement ring, and your beautiful creation came out 10x better then we had hoped! We worked with your designers and couldn't have been more pleased. There was no pressure and we enjoyed the laid back atmosphere that fostered our creative thinking! My ring is perfect and I can't wait for you all to do my wedding band. Thank you so much for everything! Well I must say you have worked some of your magic in the creation of these magnificent rings. Thank you for all your creative artisan work both of the practical kind and also the imaginative suggestions made along the way. I just wanted to say to you and all who participated in bringing my dream to fruition, thank you! My fiancée loves her ring and everyone who sees it is astounded at its opulent beauty. 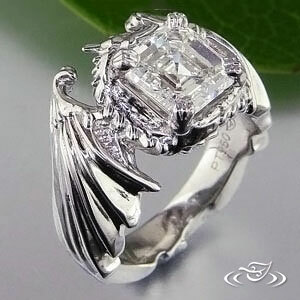 Thank you so much for the excellent work on my family crest ring. Your program of design review at each stage was very effective, especially being able to do this via email. 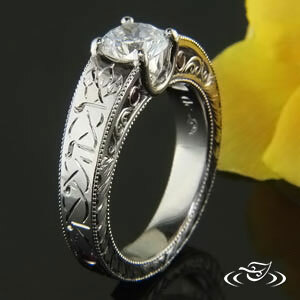 Buying a custom designed ring long distance is somewhat daunting, but you did it to perfection. Next time you are my first choice. I wanted to say a big THANK YOU to you all for the gorgeous, perfect wedding ring you designed for me. 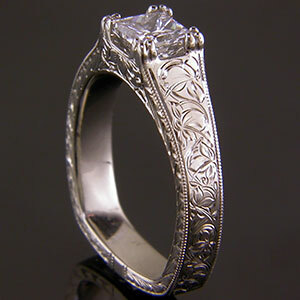 Thanks so much for your terrific help with my recent design and purchase of a “family” ring for my wife. P.S. I already see that this ring will be a treasured heirloom – it's a nice feeling knowing that this was done right! What can I write that will capture the amazing experience we have had with your shop? My engagement ring and our wedding bands were off of our expectation charts - and then there was the next custom piece - the pearl ring. 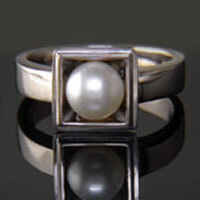 This pearl was from a very special ring given to me by my father on my 16th birthday. Let's just say the setting was outdated and it was sitting in my jewelry box for quite some time. You took my thoughts and created a one-of-a-kind treasure. My father was thrilled to see the pearl in the new setting! Thank you simply does not say enough. I am sure we will see you again for our next dream gem.